The Palmyra Nature Trail is open for business. 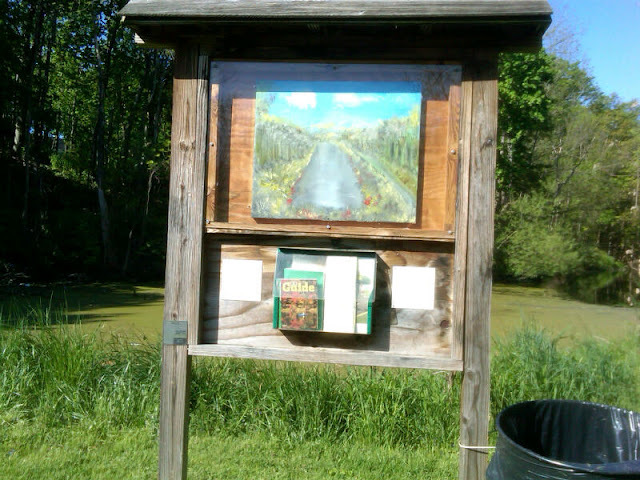 Graced by a painting on the information kiosk of the trail by local artist Joe Frontuto, the trail is an overlay of the Erie Canal Trail created by a graduate class at ESF, Syracuse, under the direction of Professor Andy Saunders. The trail is accessible from Church Street in the Village of Palmyra, runs west and the loops north and returns to Church Street along the canal on the newly improved trail. Guide books are available at the kiosk. Mr. Frontuto is also the creator of the Palmyra Carousel horses in the village park, a focal point of the village's Christmas celebration. 0 Comments to "Palmyra Nature Trail"